Paying tribute to Mike Haywood Sr. during halftime of the Saluki men’s basketball game versus Bradley University at SIU Arena. Tough shoes to fill: After 28 years of being the voice for the underrepresented student population at Southern Illinois University Carbondale, Mike Haywood Sr., legendary director of the SIU College of Business Office of Minority Affairs, officially retired Dec. 31. 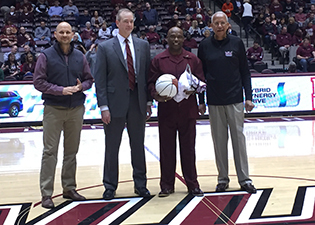 His extraordinary service and dedication were honored Feb. 17 during halftime of the Saluki men’s basketball game versus Bradley University at SIU Arena. A signed basketball and award were presented to the East St. Louis native by interim Dean Jason Greene as well as alums Harold Bardo and Joel Sambursky. Bardo is the retired director of the SIU Medical/Dental Education Preparatory Program and recently served as the interim director for intercollegiate athletics. Sambursky is a member of the SIU Board of Trustees and is the president and founder of Liberty Wealth Management. The special ceremony was followed by a well-attended retirement party on Feb. 20 at the Saluki Stadium Club Suites, in which faculty, staff, students, alumni and former mentees gathered with Haywood’s family and friends to pay tribute to the two-time SIU graduate. His exit leaves a gaping void – yet, by the same token, it provides an opportunity for the college to challenge itself to grow and develop. Gebke, who was given the challenge of ensuring a seamless transition of one of the only college-based support services for minority students at SIU Carbondale, envisions a future of Haywood’s vision in which student involvement, academic coaching and proactive outreach to mentors and mentees are highly promoted. As the first step in this direction, graduate students Chasity Jones and Lisa Clinton have been appointed to help lead the office during the transitional phase until an appropriate successor is found to continue Haywood’s legacy. In addition to providing the established services to the students, one of the immediate challenges is to find sponsors for the registered student organization (RSO), which Haywood oversaw. Special events and cultural road trips – such as the trip to Memphis, Tennessee, for Black History Month – have always been an integral part of the SIU College of Business’ Office of Minority Affairs that Haywood started soon after he joined the College of Business as an advisor in 1988. According to Gebke, upcoming events will primarily focus specifically on mentor and mentee get-togethers. “We will have about two events per month, including ‘study jams’ and other events to provide opportunities for networking and engaging,” she said. The Office of Minority Affairs will make improvements based on recommendations from the committee for diversity and inclusion that was put in place last fall. “They are now taking a look at what the college needs to be doing, where we going and what opportunities are available,” Gebke said. “So we are going to wait until they give us more foundation before we move forward with refilling this position. Haywood, the recipient of multiple awards in his 28 years of service to the minority students of SIU’s College of Business, couldn’t agree more. He started and built the Office of Minority Affairs on similar beliefs. The result of his efforts was one of the very first formal mentoring programs on campus. Alumni and friends can help future generations of students through a gift to the recently established Michael L. Haywood Scholarship, honoring Haywood’s legacy at SIU and the College of Business. To make a donation or for more information about the scholarship, please contact Pat Moline at patm@foundation.siu.edu. The SIU College of Business will miss Haywood’s expertise and unique presence in Rehn Hall. Enjoy your well-deserved retirement, Mike Haywood!